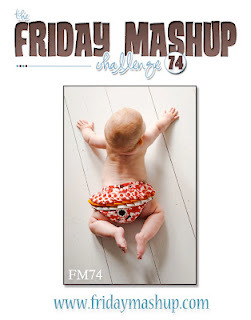 It's time for another Friday Mashup challenge! This week Amy is bringing us the challenge and it's a fun one! She wants to create a project that uses pleating, create a baby themed project OR mash it up and create a baby project that uses pleating. I will be the first to admit that I don't particularly do well with projects for babies. Maybe its because my kids are older and I don't deal with anyone on a daily basis that has a baby but I just can never seem to get my creative juices flowing for a project like this. After some hemming and hawing I finally decided on a neutral baby card that can be given to someone as a congratulations card. I used some retired stamps and DSP to finish the card. The pleating is in the form of some pleated Baja Breeze ribbon. Make sure to head over to the Friday Mashup blog to see the rest of the cards from the design team, you wont be disappointed! Beautiful card! That pleated ribbon really makes a pretty statement! Love the cute image too! I know what you mean about baby cards, Lisa. They seem to stay in my stash forever. 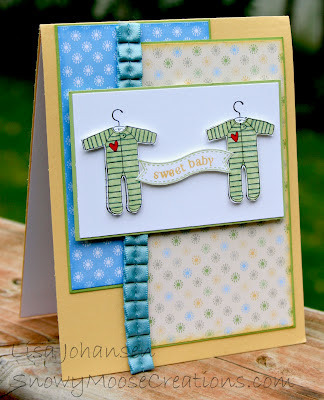 This is so sweet with the pleated ribbon and the little sleepers! And that's perfect paper for a baby card. I think I still have some of it. Beautiful! I love your combination of colors and patterns here! It would work great for a boy or a girl! Thanks for sharing such an adorable card! This is such a great neutral baby card - those onesies are so cute with the banner in between - and the mix of dsp looks fab! Great card Lisa! Those onesies are so cute. That pleated ribbon puts all the elements together.